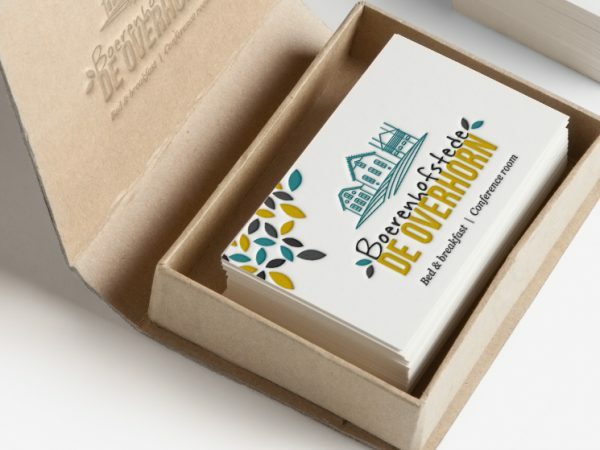 Daphne D. Fase-Kortekaas designed these business cards for Boerenhofstede de Overhorn, a renovated farm (guest house) from 1886 that located near Amsterdam in a quiet place called Weesp. The client wanted a new identity to reflect the brand’s vision – to create warm and welcoming atmosphere, with a mix of old and new. Daphne met her client several times on the estate and was amazed by the beautiful scenery there. She thought of emphasizing that when creating the logo, therefore the illustrated farm with three buildings and the autumnal colors were added to the card. A handwriting typography was included in the logo, giving the brand a modern vibe while adding a personal touch. When everything blend in together, the result is eye-catching! You find yourself reaching for the calendar, wanting to book yourself a vacation asap. These business cards were printed on 300g of wood-free paper by a digital printing company named Drukwerkdeal.